Super Hero Boy: What every girl really wants! What every girl really wants! I've said it before and I'll say it again though there may be fancy phones, mp3 players or expensive purses on our wish list the one gift that women really remember for a lifetime is a really beautiful thoughtfully picked out piece. After all a beautiful piece of jewelry can grace an arm, ring, or neck for a lifetime. The problem I hear from most guys looking to buy something is what on earth do I buy, as sending a a guy into a jewerly store is almost a disaster waiting to happen unless he just really great at picking out jewelry or already has something specific in mind. Shopping online for jewelry can be so much less stressful, it seems as if its just easier to compare pieces and pick out something that you really like instead of being overwhelmed by a sea of sparkles as even I find myself feeling a little jittery in a jewelry store especially if I have a sales person breathing down my neck. With that said online shopping can be scary for some as its not always clear of the quality of a piece unless you see it in person. I've ordered several times from online sites to only be disappointed but of all the items I have seen from Ice.com its been quite the opposite. Ice.com really seems to take personal pride in the way the represent their items. Sure pictures always look gorgeous online but I can't even tell you how many times I've gotten excited about a piece, gone to look at it, and its nothing like the picture. My experience with Ice.com however has been quite the opposite. I agonized over the holiday gift guide. I really wanted to find an item that all of my women readers would love but was still very affordable. I fell in love with a 33 carat Sky Blue Topaz tennis bracelet right off the bat as I have always dreamed of having a diamond tennis bracelet but like most of us there is just no way I could afford one. The Sky Blue Topaz Tennis bracelet has all the charm and class of a diamond tennis bracelet with a price tag that will make you jump for joy as it costs $150! Blue Topaz is a beautiful stone that is very durable but depending on the quality of the stone it can vary quite a bit in color. The moment I opened the box on my Ice.com Sky Blue Topaz tennis bracelet I gasped as though I expected it to be beautiful nothing not even the Ice.com pictures online prepared me for just how nice it really is! I get comments on the bracelets everywhere I go, the stones are clear, bright, and a beautiful shade of blue. It's really a substantial piece and it looks amazing with a pair of jeans and a winter sweater or alone as an accent piece with a little black dress. Its one of those items that is as much at home in a formal event as it is going with me to school every day. Though it may not be the diamond tennis bracelet I always longed for, I have to admit I certainly don't miss it with that topaz bracelet on my wrist. If your curious yes Ice.com does actually sell my dream bracelet too. If your looking for something really special for someone on your gift list you can feel good about making a purchase from Ice.com. Most of their inventory offers multiple pictures as well as videos of the jewelry being worn which is a great way to really see the scale of a piece and its much easier to see the quality of an item in a video than a picture if you ask me. Regardless all Ice.com purchases come with a full guarantee if you do not absolutely love your purchase you can return it to Ice.com at their expense no questions asked. This means you can wear the piece for sixty days and if you are just not head over heels for it or its just not what you hoped for you can return it as long as its still in the same condition as it arrived. You can search for the perfect gift by using one of several holiday guides by Ice.com. Take a browse through the Ice.com Holiday Gift Guide, The Holiday Color Guide (the same guide this bracelet is featured in, or you can search the main Ice.com home page to search by jewelry type, price, or even just look around! You can make payments too! Ice.com has been amazingly generous to offer us a Sky Blue Topaz Tennis Bracelet to give away to one incredibly lucky reader. Seriously you will love it and it would make for an amazing Christmas or Valentines day present (you can thank me later guys). The bracelet is a a $150 value! That bracelet is so gorgeous, I so wanna win! In the gift guide I'd want the 5/8 Carat Ruby and Diamond 14K White Gold Journey Heart Pendant w/Chain, stunning! I definitely want the 163 Carat 36 Inch Multi Gemstone 14K Yellow Gold Necklace. But then, I want it all! Oooh, decisions! I'd go for the cultured pearl necklace with 14K gold - simple and classic. I'd love to have the 2 1/6 Carat Yellow Sapphire and Chocolate Diamond 14K Yellow Gold Earrings for Christmas! 11 Carat Sapphire Sterling Silver Bracelet with Diamond Accents will be on my Xmas list! The Smoky Quartz ring is my favorite..... Its so unique and really gorgeous!! Love it! I subscribe to your blog also! I haven't been wearing earrings lately because a lot of posts bother my ears. But I don't think I'd have that problem with gold posts. I'd love the Diamond Earrings, 14K white gold stud 1/2 carat. besides the sky blue topaz tennis bracelet, i would love the beaches vacation. only wish i could afford it. I absolutely love Blue Topaz! I would love to add that beautiful bracelet to the pieces I already own. I would also love to have a anniversary band one day. The blue topaz with brown diamonds rings is to die for!! i love the 1/2 carat Chocotale and white diamond white gold earrings! The 2 Carat Diamond Stud 14K White Gold Earrings are GORGEOUS! Santa please hear my plea to find those in my stocking on Christmas morning! I'd love to get the 14K Yellow, White and Pink Gold Cuff Bracelet for Christmas. I love the timeless design of the Sterling Silver Diamond Earrings. I love the simple lines of the 14K Yellow Gold Diamond Heart Pendant w/Chain. This would make a wonderful gift to me. I love it all!! I would choose the 6 3/4 Carat Blue Topaz and Rhodolite Sterling Silver Ring it is so unique. It would go realy well with the bracelet too! I love the 1/3 Carat Diamond and Ruby 14K White Gold Heart Pendant w/Chain. It's so pretty and reflects my style perfectly. My fav is the 11 Carat Amethyst and Lavender Jade Sterling Silver Bracelet. I love this tennis bracelet, and also love the 14K Yellow, White and Pink Gold Cuff Bracelet. I love the 1/2 Carat Opal and Diamond 14K White Gold Ring. I love the 1 Carat Chocolate and White Diamond 14K White Gold Hoop Earrings. I would absolutely love the 1/10 Carat Diamond Stud 14K White Gold Earrings. I've always wanted a pair. The bracelet is really gorgeous. Thank you! I love the 1/4 Carat Diamond SI2/I H/I 14K White Gold 6 Prong Ring. I like ICE STYLE: # NSW 100276, the 19" Multi-Gemstone and Pearl Necklace. i want to win the bracelet to give my mom for christmas it's gorgeous!! but i want the diamond 14k white gold filigree ring for myself i love it!!!! I've lately become fascinated with green amethyst and especially like the 4 3/8 Carat Green Amethyst and Diamond 14K White Gold Ring. I really like the 14 karat white gold diamond heart earrings!! Great giveaway! I really like the 11 Carat Amethyst and Lavender Jade Sterling Silver Bracelet. So pretty! Thanks! I like the 1 Carat Diamond 14K White Gold Eternity Ring. It would make my CHristmas. The "11 Carat Amethyst and Lavender Jade Sterling Silver Bracelet" would look great in my stocking! I subscribe and your button is on my blog. There is so many beautiful things. One thing I would really like 8-9mm Cultured Freshwater Pearl and Peridot Swarovski Crystal Necklace $45.00. I think it's so beautiful. I like the 14K white gold diamond heart pendant w/chain. I love the 4 Carat Blue Topaz and 1/10 Carat Diamond 14K White Gold Ring that matches the bracelet. The color is gorgeous. It's so classy! I love the Tahitian Cultured Pearl 14K White Gold Earrings. They're simple and very elegant. The white gold diamond pendant is beautiful! The 14 karot gold earings are sensational. So many gorgeous items. I really like the simplicity of the 14K Yellow and White Gold Hoop Earrings. Thanks for the great opportunity. I've always found pearls very classy so from the holiday catalog of ice.com I would also like to have the 10-11mm Cultured Freshwater Chocolate Coin Pearl and Brown Diamond 14K White Gold Earrings. Thank you for the special giveaway! For my wife, I like the 14K, White and Pink Gold Cuff Bracelet. These (4 1/4 Carat Green Amethyst and Diamond 14K Yellow Gold and Sterling Silver Earrings) are stunning! I especially like them because they combine silver and yellow gold. The tennis bracelet would look perfect on me! Hope you pick my name. 2 Carat Diamond Stud 14K White Gold Earrings -- a girl can dream, no? I would want the 2karadiamond stud earrings. I really like the 14K Yellow and White Gold Hoop Earrings as well as the cultured pearl necklace. ICE STYLE: # NDY 014016 is my favorite. The very feminent, simple classic lines with the sweet heart dangle is perfect for ever occasion just like the blue topaz bracelet that I would love to win! 11 Carat Sapphire Sterling Silver Bracelet with Diamond Accents!! honestly - this bracelet would be my favorite! But I also like the diamond tennis bracelet. Gorgeous bracelet - it's my birthstone! I also love aquamarine and the 7/8 Carat Aquamarine and Diamond 14K White Gold ring is just breathtaking! I also just subscribed as a reader! I would like the wonderful, safe car seat for my car when I want to take my first great grandchild with me. I love the sterling silver diamond earrings they are very beautiful! Other than the beautiful bracelet I would love to get the 1/2 Carat Diamond 14K White Gold Necklace in my stocking. I really don't think I have been that good though. I really love the 1/2 Carat Sapphire and Diamond 14K White Gold Ring. I hope Santa is listening. Thanks for this wonderful giveaway! I love the 14K White and Yellow Gold Heart Link Bracelet. Thanks for the contest! Multi-Colored Cultured Pearl Necklace and Bracelet Set w/Sterling Silver Clasp is my pick. oooh, that bracelet is gorgeous! And blue is my favorite color! 11 Carat Sapphire Sterling Silver Bracelet with Diamond Accents is gorgeous!! I have looked at the ice.com website a lot. I love rubies and a nice ruby bracelet or some earrings in 14K gold would be great to have. I have loved rubies since i was a kid, my first ring was a small solitaire ruby ring. my dad gave it to me, i still have it too. Well, if I could have ANYTHING at all it would be the 4 Carat Diamond 14K White Gold Bracelet. (ICE Price: $2,695.00) Oh, yeah! Ooh, the diamond initial pendant is gorgeous! Thanks so much, that bracelet is beautiful! I would like the 1 7/8 Carat Sapphire and Diamond 14K White Gold Ring for Christmas. I WOULD WANT THE 1 CARAT DIAMOND 14K GOLD TENNIS BRACELET. 11 Carat Sapphire Sterling Silver Bracelet with Diamond Accents. My wife would love the 11 Carat Sapphire Sterling Silver Bracelet with Diamond Accents. I also like the 3-stone, 2-carat gold ring. What a gorgeous bracelet! I also like the 1carat diamond tennis bracelet with the yellow gold heart charm! Wish my husband would read this! I would love the engagement ring, 3/4 Carat Diamond I1/I2 I/J 14K Two Tone Gold 6 Prong Ring, that I never got. I like the romantic heart pendant. Thanks for the contest! Love the green amethyst ring! I love the 1/4 carat Black Diamond 14K White Gold Stud Earrings. Not a bad price, either! I really like the blue topaz and rhodolite sterling silver ring. thanks for the contest! I would love the 14 1/2 Carat Created Pink Sapphire Sterling Silver Bracelet w/ Diamond Accents. It's beautiful. The 11 Carat Sapphire Sterling Silver Bracelet with Diamond Accents is what I would want bedazzling my wrist for Christmas!! Thank you for the contest! ICE STYLE: # ECC 018871 are lovely. Would be a great addition to my jewelry box! I love the 1/4 Carat Diamond 14K White Gold Circle Pendant! I'm a suscriber. Thank you! I also really like the 14K Tri Color Gold Heart Drop Necklace. A heart for each of my 3 children. Thank you! I really WANT the 1 1/5 Carat Chocolate and White Diamond 14K White Gold Ring. Santa needs to know this of course. I think I hear him now. I love the 14k Yellow, White and Pink Gold Cuff Bracelet!!!!! It's all so beautiful, but I really like the 6 1/8 Carat Green Amethyst and Diamond 14K White Gold Pendant w/Chain. Ok, now, seriously, I WANT that tennis bracelet!! Who do I need to talk to? Santa!! Are you LISTENING!! I WANT THAT TENNIS BRACELET. It is beautiful!! WOW!! Again, WOW!! I also liked the Sterling Silver Heart Tag Bracelet With Lobster Clasp. Simple but pretty. I have been eyeballing this ring (5 3/4 Carat Green Amethyst, Lemon Quartz and Olive Quartz 14K Gold Ring) for about a year now. When I get the money I will order it. Other than that I love that bracelet!! This bracelet is gorgeous and my birthstone! I also love their 1/6 Carat Diamond 14K White Gold Filigree Ring, so beautiful. Thank you! I like the 14K Yellow Gold Amethyst and Lavender Jade Pendant w/Chain which is the shape of an elephant. Thanks! The 1/5 Carat Diamond and 7/8 Carat Multi-Gemstones 14K White Gold Ring caught my eye. How different, sure to bring many compliments. Thanks! I want the classic pearl necklace. I love blue topaz. I have a pair of blue topaz earrings that bracelet would look incredible with. From the site I also really love the 1 Carat Tsavorite and Diamond 14K White Gold Pendant w/Chain. It's so beautiful that I can't believe it's under 200.00! I'd love the 1/2 Carat Diamond 14K White Gold Ring for Christmas! Thanks for the opportunity! 1/2 Carat Opal and Diamond 14K White Gold Ring. Love the 1 1/2 carat Tanzanite and diamond 14 K White Gold Earrings!! The 1/3 Carat Diamond and Ruby 14K White Gold Heart Pendant w/Chain is beautiful!! I'd love that! I would pick the pearl and white gold earrings! I like the "1 Carat Tsavorite and Diamond 14K White Gold Pendant w/Chain." The stones are just gorgeous. What an elegant addition to a holiday outfit. I like a dangle, so the 1 7/8 Carat Citrine, Diamond and Cultured Pearl 14K White Gold Earrings sang to my heart. Opal and diamond gold ring. The Smoky Quartz ring is my favorite. Oh my this one is beautiful: 1/6 Carat Diamond 14K White Gold Filigree Ring. I LOVE IT. I like the Croton Mens Watch on Rubber Strap. The 2 carat Diamond stud 14k white gold earrings. The green amethyst and diamond earrings are beautiful!! Thanks! I love the 14K White Gold Diamond Heart Earrings. so pretty! I'd love the 2 1/6 carat yellow sapphire & chocolate diamond earrings. Hope they are under the tree christmas mourning. Saving this as a hint for hubby. the sterling silver heart tag bracelet is very pretty and my mom would love it! 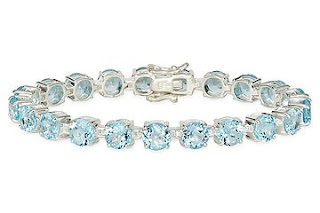 I love the bracelet you are giving away, blue topaz is one of my favorite gemstones! A few years back we got some watches from Ice.com and they were lovely-better than the photo showed, and the recipients loved them! Green 3 5/8carat Tsavorite 14k White Gold Bangle ICE STYLE:#BCC 017998 for $625. I love to pair Green and Blue together, whenever I look at them it reminds me of the ocean. First time subscriber, Good Luck to Me. The tennis bracelet is amazing! I also like the 1/4 Carat Diamond Stud 14K Yellow Gold Earrings - WOW! Love it! Thanks for the entry! Ack! That was torture... so many beautiful things... I have to say the 1/2 Carat Chocolate DIamond and White Diamond 14K White Gold Heart Ring is what stole my heart (no pun intended). I love the 1/2 Carat Diamond 14K White Gold Necklace. So beautiful. I love all the items in the store. Thanks for the chance. Blue Topaz and Rhodolite Sterling Silver Ring is really pretty! But I have had that bracelet on my wish list for a long time. Well since we're dreaming, I'll dream big and say the 1/2 Carat Diamond 14K White Gold Necklace is my favorite. I love " 2 Carat Diamond 14K White Gold Branch Necklace "
I love the 1/5 Carat Diamond 14K Two Tone Gold Ring; would love to see it under my tree! I'd go for the cultured pearl necklace with 14K gold - simple and classic. I like the 1 carat diamond bezel set earrings. I really want the Stainless steel LINK and Rose Gold HEART Bracelet #BSW030025. It is very modern and bold, and it has an amazing price for being so unique. Great find and a really exquisite giveaway!!! And, if you must know......Yes, I am ashamed of my title, but only a little. This is a beautiful giveaway! Thanks for the extra chance to win! Dream! Dream! Dream! I'll be dreaming of getting the Cultured Pink and Black Pearl and 1/10 Carat Diamond 14K White Gold Earrings for Christmas. The Diamond Stud 14K White Gold Earrings are hot!